What does a 65-year-old German novelist and a young aspiring writer have in common? An inspired love of the art of writing, may be the most logical explanation. But is there something else? Something even more personal? Erich Ackermann is gay and has spent his entire life in solitude, writing books and working as a professor. Until recently his books seemed to have gone fairly unnoticed. These books have a common theme - loneliness - somewhat mirroring his life. But, fate has intervened and changed the course of his writing career. Now, he's famous; recognized by the literary community as an author to pay attention to. He’s on a book tour when his path crosses with the young charming, seemingly available, Maurice Swift. Taken by his beauty and demeanour, Erich is undeniably attracted to Maurice who charms the socks off of him, by appealing to his writer sensibilities. Erich obliges, and takes Maurice under his wing, even offering him an opportunity to travel with him on his book tour. A friendship ensues, that seems authentic, and Erich ends up revealing deep, dark secrets about his own past to Maurice. Although the relationship is never sexual in nature, there seems to be a familiarity to the conversations, and Erich aches for a possibility of something more than a mentor/mentee relationship. The first part of the novel is from Erich’s point of view. When we meet Maurice again in the second half of A Ladder To The Sky, his life has taken a dramatic turn. A successful debut author, and a married man. The surroundings may have changed, but the skin remains the same. Charming, yet duplicitous, we come to see a different character from what our heart ached for in the start of the novel. A dramatic turn for a novel the started off like it was going to evolve into a love story of epic proportions. John Boyne is no doubt a masterful storyteller. His command of structure and style, combined with an ability to weave in history, is precise and yet feels completely natural. There was a certain sense of familiarity to Maurice's character. Right from the get-go, the resemblance to Tom Ripley in Talented Mister Ripley was uncanny. The characters, the scenarios...the double-crossing. In a book where the protagonist is a writer, there's bound to be a ongoing discussing about writing technique. This is also the part of the book that I enjoyed. Like a fly on the wall, I read on, absorbing the conversations, characterizing the two men, and getting into their heads. Even early on, you could see the purposeful questioning style of Maurice, which although inquisitive, was more of an observer, a keen student, intent on drawing out stories from his older, accomplished mentor. On the other hand, there was Erich, who was so taken by Maurice's attention, and after a lifetime of solitude, was aching to release some of the dark secrets that had haunted him for most of his life. 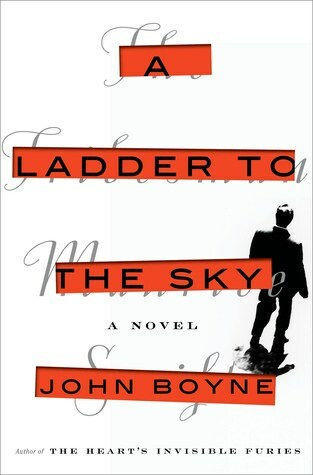 A Ladder To The Sky is a compelling read. You desperately home that Erich, will be able to fill the void that haunts his life. You want to understand his past, and forgive the choices that he made. But, as a reader you are also torn. Ambition can be a good thing, but at what cost? Then there's Maurice, who has that ambition to be a great writer, but lacks the talent. A parasite, looking for his host, he displays a cocky confidence and the ability to justify the wrongs in his life. What's wrong with going after what you want? Guilt, is a not a word in his vocabulary. As a reader you are thrown back by his nonchalant attitude, yet, it is oddly addictive. Akin to watching a train wreck, you can't pull yourself away from continuing to read more and more, of John Boyne's thrilling masterpiece. "I may have taken advantage of his good nature, but why not? I flirted with him, made sure that I remained sexually ambiguous at all times. Always a possibility but never a certainty. I led him on to the point where he was so overwhelmed with desire that I think there was literally nothing he wouldn’t have done for me, had I asked." A Ladder To The Sky is storytelling that's precise, powerful, and all consuming. John Boyne's words spread like cancer in your mind, consuming you long after you have finishing reading it. What's right and what's wrong? What would you have done in that situation? The literary novel is a deep dive in trying to understand the human condition, analyzing what moves us, what influences our decisions, and whether we'd have decided differently if we'd be in a similar situation. Should we be forgiven for our decisions, because they we made during a time of duress, or do we always have a choice? Just read A Ladder To The Sky and let's discuss.